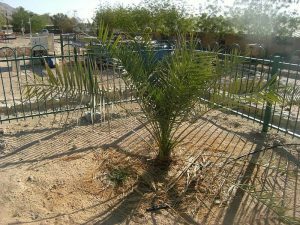 According to legend, the extinct Judean date palm was the tree whose fronds made way for Jesus and his donkey on Palm Sunday. A botanist has literally resurrected it from an ancient seed. The Judean date palm flourished throughout the Middle East for thousands of years before the Romans conquered Jerusalem around 70 AD. The fruit of the trees — dates — served as a staple food in the region, while its leaves provided shelter and shade. A symbol of fertility, the tree was used as an aphrodisiac and cherished for its medicinal properties. According to the Old Testament of the Bible, King David named his daughter after the Hebrew word for the tree — Tamar — and according to the New Testament, Jesus followers’ laid date palm leaves at his feet when he and his donkey came riding into Jerusalem. Likely because the trees were so central to the Judean economy, the Romans wiped them out. By 500 AD, they were extinct. Luckily, someone preserved a batch of the tree’s seeds in a clay jar just before they completely disappeared. Archaeologists found the jar in the ruins of Herod the Great’s palace in the 1960s. Carbon dating revealed the seeds to be about 2000 years old, the last living vestiges of the long lost Kingdom of Judah… yes, living. After sitting in a dusty university drawer for decades, an archaeologist challenged a botanist to do the unthinkable — germinate them. “You want me to do what?” desert agriculture expert Elaine Solowey said when she was first propositioned. “I assumed the food in the seed would be no good after all that time. How could it be?” she told National Geographic. But she gave it a go. She soaked the seeds in hot water and then in a solution of nutrients and enzymatic fertilizer. She planted them in pots in January of 2005, and sure enough, by March, one sprouted, becoming the oldest known tree seed to germinate. “I couldn’t believe it,” Solowey said. Today, the tree continues to grow and thrive. As of 2015, it was 10 feet tall, growing flowers and making good pollen. The tree is a male tree, unable to produce fruit, so now researchers are working on sprouting a female from the same batch of seeds, so Methuselah (as he’s been dubbed) can pollinate her. Genetic tests indicate that Methuselah is most closely related to an ancient variety of date palm from Egypt, which fits with a legend that says dates came to Israel with the children of the Exodus, Solowey says. She hopes to establish an orchard of ancient dates, so she and colleagues can study the plants to see if they have any unique medicinal properties.